Kelliann Whitley joined Blake Real Estate in 2003, as a senior property manager. She manages the buildings at 1425 K Street NW and 2100 K Street NW. A customer service perfectionist, Kelliann’s property, 1425 K Street has received a High Honorable Mention for Apartment and Office Building Association’s (AOBA) prestigious “The Office Building of the Year” Award (TOBY) several times. The Washington Business Journal awarded the 1425 K Street Green Roof project the “Best Sustainable Growth & Environmental Impact” Award. 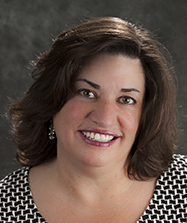 Kelliann has over 25 years of Class A property management experience and she has received numerous awards including the “Rising Leader” Award from AOBA. Kelliann and her Team have worked together for over twelve years. Before joining Blake Real Estate, Kelliann was a property manager with Boston Properties for 10 years in Boston and Washington DC., and with USAA Realty and Tishman Speyer in DC and Virginia. Kelliann is interested in the study of green roofs, enjoys Cape Cod, traveling, wine, time with pets, family and friends. She is passionate about rescuing pets.